With the pageantry and unexpected national notoriety in their rear-view mirrors, the 2018-19 Loyola-Chicago Ramblers’ groundwork is being put together brick by brick. Gone are cornerstones Sam Richardson and Donte Ingram, who played pivotal roles in Loyola-Chicago’s unexpected run to the Final Four last season. However, it is not about what you lose, but how a team can adapt to change. With a combination of incoming freshmen and transfers, highlighted by Aher Uguak, who sat out last season after leaving New Mexico, Loyola-Chicago will look to incorporate more post players into the rotation after relying heavily on a four-guard system. 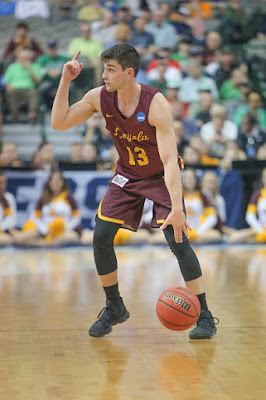 The cover was not left bare as Loyola-Chicago returns a pair of key parts from last season in Missouri Valley Conference Player of the Year Clayton Custer and Marques Townes. Ramblers coach Porter Moser looks to keep things even-keeled as a new leaf turns and wants Custer and others to stay hungry and humble. With several practices in the books, Townes knows complacency can’t be tolerated as progress is key to similar achievements from 2017-18. Sophomore center Cameron Krutwig stepped up as a freshman with the ability to use his stocky size to cause matchup problems and execution in the paint from five-feet or less on offense with 10.5 points per game. Krutwig knows in order to take the next step to becoming an all-around player that the work must be put in off the court. In the Ramblers’ conditioning program, Krutwig has dropped 10 pounds in the offseason in hopes to become more agile on the court. The addition of Valparaiso to the MVC should boost Loyola-Chicago’s in-conference strength of schedule, along with potential challengers in Illinois State and Southern Illinois. The Ramblers also elevated their non-conference slate highlighted by a Sweet 16 rematch from last season against Nevada at Gentile Arena and a road game against Maryland. Moser proclaimed that the Ramblers’ resume’ will be well-rounded come the month of March if everything works out in their favor.